Far Cry 5 has three pets you can befriend and enlist to help you fight enemy cultists. They’ll help you, and they’ll follow you anywhere. They just won’t ride with you in a car. I can forgive that for the cougar or the bear. In the case of the third animal, a dog, it’s borderline criminal, and Ubisoft needs to fix it. Far Cry 5’s Montana looks is full of wide-open spaces to run around in, rivers to swim through and plenty of trees fo a good dog to pee on. Boomer, the game’s now iconic canine, seems to agree. When he’s not mauling enemies and stealing their guns, he’s bolting ahead of me into the tall grass or up the mountain slope and barking back at me in anticipation. You can also pet Boomer, instantly elevating him toward the front of the video game dog pantheon. Boomer is a life-saver. Sometimes I get shot to a near-fatal state and drop to the ground. Boomer hurries over to rescue me, helping me to avoid a “game over” and the load screen. When he’s on the ground and bleeding out I do the same, even when it’s not convenient, even when it imperils my own life. I don’t have much affinity for real dogs, whose panting, knotted fur, and penchant for slobber all on some level repulse me. Boomer has managed to overcome my prejudices, perhaps as much for what he lacks as a virtual pet as what he’s able to convincingly simulate. He has pawed his way into my heart. I care about Boomer. He’s not real. Just a bundle of polygons and fur textures. But my lizard brain can’t help it. Because I like Boomer so much, I am really bummed that he won’t ride in a car with me. Far Cry 5’s world is big, so the game gives you helicopters, planes, and an endless parade of pickup trucks and ATVs to navitage it. Your human companions can all join you in these vehicles. Walk up to a car, get in and they’ll do the same. They can even drive for you. Boomer, and the game’s other animal buddies, cannot. When I’m barrelling down tree-dotted hills and dusty roads in a hatchback or 4x4, Boomer tries to keep up on foot. He’s quite good at it, most of the time. On rare occasions he can get left behind and the game, unsure of what to make of his absence. When this happens, the game unspawns him and puts him on a cool down timer as if he’d been killed in action. Me about to head off into the night right after reading Boomer his favourite bed time story, Go, Dog. Go! Where I live, much to my surprise, I’ve often seen people carrying their dogs in their arms while ostensibly on walks with them. 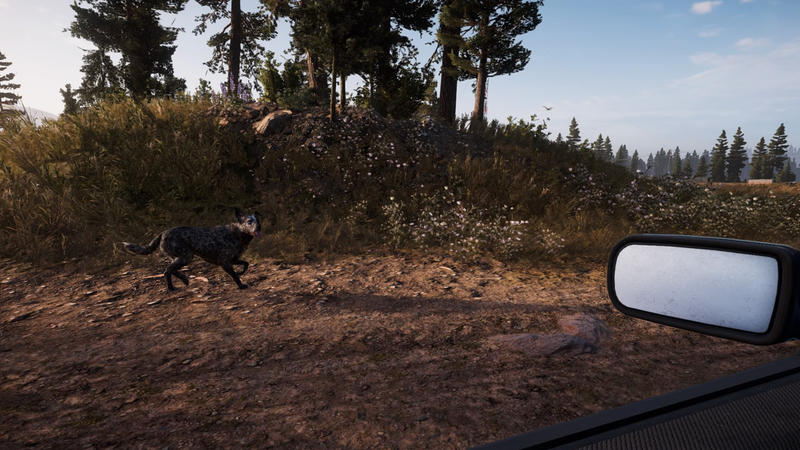 Having watched Boomer fade from my rearview mirror too many times to count, I now find myself wishing I could do the same with Boomer in Far Cry. Maybe then, even if he wasn’t willing to hop in the passenger-side seat of my sedan or get in the back of the pickup truck where there’s more than ample room, I could at least put him there myself and drive us to the lake for some fishing or any of our other favourite Hope County destinations. I’m not the only one who’s struggled with this impasse. Other Kotaku staff writers have shared similar frustrations. The game’s subreddit is full of people talking Boomer’s vehophobia (fear of driving). “Is there a way to get Boomer to ride in vehicles?” Half-Life and Portal writer Chet Faliszek asked the other day on Twitter. He’s not alone. Wherever you look, Far Cry 5 players want to know the same thing. Kotaku reached out to Ubisoft for an explanation—perhaps there’s an interesting technical reason why animals are forbidden from getting in cars in Far Cry 5—but hasn’t yet heard anything back on this important matter. 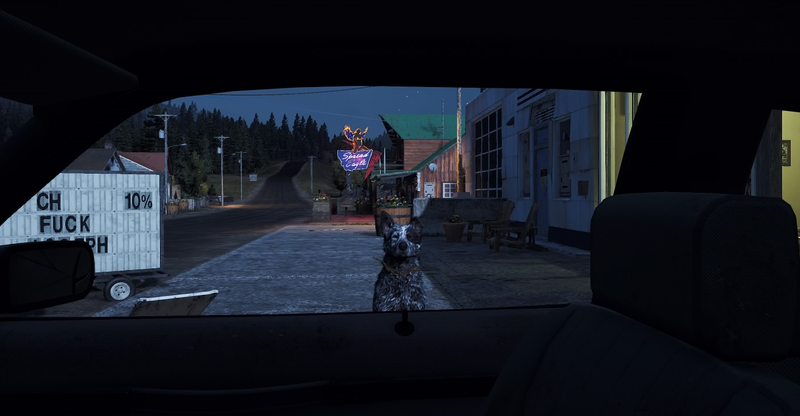 While it’s by no means a scandal, some frustrated Boomer-lovers have pointed to old Far Cry 5 marketing shots that show Boomer in the back of a pickup truck, leading to conspiracy theories that being able to chauffeur one of gaming’s best dogs around Montana was at some point a feature intended to be in the game. Who knows, it might still find its way in eventually. Games now get patched regularly, and Far Cry 5 already has its first Live Event planned to begin next week on 3 April. Hopefully a Boomer hotfix isn’t far behind.